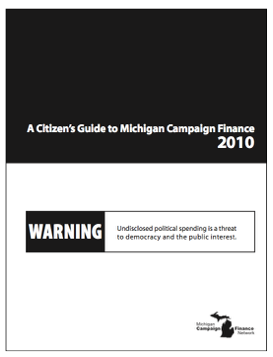 This document examines the money in Michigan's 2010 election. The 2010 state political campaigns were not the most expensive in Michigan history. However, they did set a record as the least accountable campaigns ever for the major statewide offices. Of $61 million spent in the races for governor, secretary of state, attorney general and justice of the Supreme Court, $22.9 million was not disclosed in the State’s campaign finance reporting system.